A rolling pin is a cylindrical food preparation utensil used to shape and flatten dough. Two styles of rolling pin are found: rollers and rods. Roller types consists of a thick cylinder with small handles at each end; rod type rolling pins are usually thin tapered batons. Rolling pins of different styles and materials offer advantages over another, as they are used for different tasks in cooking and baking. Rod: Thin rods typically made of wood around 2–3 cm in diameter. They are used by rolling the rod across the dough using one's palm. The pins may be tapered at one or both ends for more pivot control in certain tasks such as making small jiaozi skins or pie shells. Most East Asian or French style rolling pins, and the Turkish Oklava are rod style. Roller: Consists of a thick heavy roller made of a variety of materials around 7–10 cm in diameter with thinner handles which extend through the roller. They are used by grasping the handles and pushing the pin across the dough. 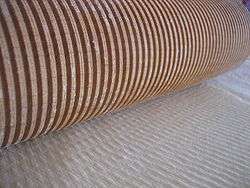 Many Western rolling pins are roller types. 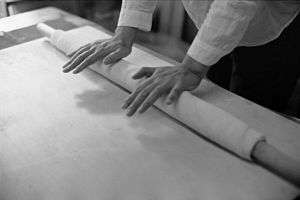 Textured: Some specialized rolling pins have textured surfaces that mark and indents the dough surfaces for special breads and pancakes. They may even be embossed with writing. In South Asia, the rolling pin (belan) is used in combination with a chakla (flat circular rolling board). 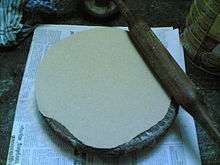 The dough for chapatis is rolled on the chakla with the help of the belan. A modern electronic device, a small kitchen appliance called a Roti Maker (or Tortilla maker) combines the function of chakla, belan and round electric tava cooking griddle. Rolling pins come in a variety of sizes, shapes and materials including glass, ceramic, acrylic, bakelite, copper, brass, aluminium, silicone, wood, stainless steel, marble, and plastic. Some are hollow and are able to be filled with cold or warm water to better roll a desired food. Marble rolling pins are often cooled in a refrigerator for maintaining a cold dough while making puff pastry. An angry housewife wielding a rolling pin as a weapon is a common cliché in humour, as for example in the English comic strip Andy Capp. Wikimedia Commons has media related to Rolling pins. ↑ Green, Anna. "Personalize Your Pastries With Embossed Rolling Pins". Mental Floss. Retrieved 13 September 2016.